By Andrew Stevens and Harri Baskoro A. 12 February 2014: The fourth largest country in the world, covering most of the Malay Archipelago and bridging South East Asia and Australasia, the Republic of Indonesia has made the transition to full democracy after three decades of post-colonial dictatorship. After years of centralisation, Indonesia is now witnessing a rebirth of local democracy and is served by 34 provinces and the capital city Jakarta. In 2002, East Timor was granted independence following the resumption of democracy. The war of independence waged against the Netherlands between 1945 and 1949 saw the Dutch East Indies internationally recognised as an independent country in 1949, although Indonesia celebrates 17 August 1945 as its official independence day. Military tensions with newly-independent neighbour Malaysia in the 1960s saw the armed forces take centre stage in Indonesian politics following a supposed coup attempt by Communists. Using the coup attempt as a pretext to edge out an ailing Sukarno, General Suharto installed himself as military ruler and led the country for three decades, during which time his regime became associated with corruption and violent suppression. This was particularly evident in neighbouring East Timor, which gained independence from Portugal in 1975 but was annexed days later by Indonesia before it could gain international recognition. The Suharto dictatorship era (1967-1998) is often referred to as the New Order period, this symbolising his bid to define his rule as a contrast to the old system. Local autonomy principles devised under the ‘Old Order’ in the mid-1960s were never enacted under the Suharto regime, with national stability and integrity preferred under its own Local Government Law issued in 1974. In particular, powers were given to localities rather than regions so as to strengthen the centre. The Suharto regime gave great significance to the idea of a unitary state to both quell dissent and promote the territorial expansion of ‘Greater Indonesia’. Following the revolution of 1998, a process of constitutional reform has seen the overhaul of Indonesia’s democratic institutions and a series of decentralisation measures to guarantee local autonomy. The presidency is now elected by popular vote for five year terms and the new legislature, the People’s Representative Council, allows for an element of representation from provincial governments and debars serving members of the armed forces from office. Indonesia remains a unitary state  its provinces and municipalities co-exist on an equal basis with no hierarchical underpinning. In 2004, the number of provinces was increased to 33 following the creation of a new province. Provinces are then sub-divided into 399 ‘regencies’ (kabupaten), which are comparable to municipalities. The term ‘regency’ hails from the Dutch colonial era, when the Dutch crown appointed native tribal rulers as ‘regents’ (as per the British Raj in India). 99 cities (kota) also exist in urban centres and are regarded as equal to kabupaten. 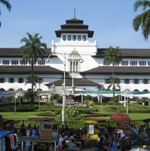 The capital Jakarta is regarded as a special city province within the system. The executive head of the special city province is the Governor (as opposed to mayor), with five kota beneath this, each headed by a mayor. Within Indonesia’s provinces there are a number of special arrangements designed to reflect complicated aspects of the nation colonial past and the varying adherence to Islam. In Yogykarta, for instance, the provincial head is the nation’s only remaining Sultan, who holds the status of de facto regional governor for life. The Sultanate is permitted to continue by the defiance of the provincial legislature, which in 1998 voted to retain Sultan Hamengkubuwono X against the wishes of central government. The final status of Yogykarta has yet to be determined with legislation still to be approved by Indonesia's central government and disputed within the Sultanate. The other special province, Aceh, was permitted to reform its legal system along Sharia lines in 2003, both reflecting the majority Muslim population and recognising separatist tension in the region. Unlike in other provinces, Acehnese have the right to establish local parties to represent their interests. The 2006 gubernatorial election was contested by national parties as well as GAM, the former Aceh rebel movement, with Irwandi Ysuf winning the governorship. In the April 2012 local, gubernatorial and mayoral elections, the province’s Aceh Party emerged as the winner. It’s candidate Muzakir Manaf defeated the incumbent governor Irwandi Ysuf. After a period of UN administration following the downfall of the Indonesian dictatorship, East Timor became independent in 2002, the only province thus far to successfully secede. East Timor was Portugal’s remaining possession in the region and in 1975 unilaterally declared independence from Lisbon following the revolution which took place in Portugal a year earlier. In comparison to Indonesia, it is Portuguese-speaking and mainly Catholic. However, it was duly annexed by Indonesia before international recognition could take place. Accusing the provisional government of East Timor to be under the influence of Communist China, Indonesia’s actions were condoned by the US on account of its own defeat in Vietnam. The end of the Cold War however, shone a spotlight on Suharto’s brutal suppression of pro-independence agitators (which saw 250,000 killed of a 600,000 population) over 27 years and coupled with his downfall, allowed peacekeeping efforts to begin before an eventual referendum on independence. It is divided into 13 administrative districts with one, Oecussi-Ambeno, landlocked by the Indonesian province of East Nusa Tengarra. This article was originally published in 2006 and updated in 2012 and 2014.